_So it's hot as blazes out there. The bees are permanently parked out on their front porch to catch the cool night air. Their nighttime hum is mesmerizing. _I asked Yvonne to permanently attach my boot bands to my bee suit (a pair of Dickey's coveralls she's been customizing for me). Olive was helping out, too. _It is haute couture. The beekeeping and fashion worlds have now collided. My friends at Belk and the local beekeepers group can both be proud now. _Ahhh, functional and easy to use. No more fumbling with the separate bands, trying to get a tight fight on my leggings so bees don't crawl up my sensitive legs and no more wondering, "Now where did I put those boot bands?!" _This end frame was blank two weeks ago. They'd drawn all of one side and most of another out. The summer feedings are keeping them hard at work building honeycomb. _Tight brood patterns were found this visit. I felt guilty working them in the heat, but it had been two weeks and I had work to do. The queen, though not seen, is doing well. Now she's laying drone cells (male bees, which are larger), at the bottoms of the frames in the middle of both boxes. You can see the larger bullet-sized cells to the right of this photo. _And for a closer view (cause one shot just won't do it). _Lots of tight brood patterns. I also found single eggs freshly laid in both the top and bottom boxes on this visit. This queen is all over the place and is laying, laying, laying. I think I'll keep her around over winter instead of replacing her in a couple of weeks. _This frame was only partially built out, and the queen had already laid eggs, both male and female, in the center of the frame where comb had been drawn out. _After having totally disturbed them on a hot, hot, hot July morning, it was time to give both boxes another powdered sugar dusting for mite control. One bee couldn't wait and hovered around the top of my sifter the whole time. I also added four beetle traps, even though I've only seen three small hive beetles this year. I think the blazing hot direct sun, and my Russian bees have kept the pests at bay. Still it pays to be prepared. The late summer is when the SHB really starts to pack a punch. They can ruin a hive, sliming it with secretions and larvae eating everything in sight. Not on my watch! Of course I was told to be careful, and I was, to not spill the oil in the traps. And of course I tipped one beetle trap just a little, but some oil leaked out. I quickly said a prayer in the hopes I haven't killed my queen. I seem to be doing that more and more. You just have to go with the flow and hope for the best ... hope that crunch you hear of a bee going to bee heaven isn't Her Royal Highness ... or that your next goofup doesn't doom your royalty. We'll see. Fingers are crossed. _I took a fourth honey frame away. This will make my split in two or three weeks go smoothly, thereby creating two hives. The new hive, Natasha, won't have to work as hard as hive Boris has. That's why I've been feeding them in the two months I've had them. They've drawn out 22 deep frames' worth of comb. I've reserved four for the second hive. Now I've added a honey super. I want Boris to draw out comb this year for honey supers, so that next spring they won't have to spend their time drawing out comb but instead bringing in nectar and creating honey. That way I should have honey next year. We'll see if they pay the super any attention. I added a queen excluder to keep her out of the super so she won't lay eggs up there. The screen is big enough only to allow the smaller worker bees up top. _After the super was added, I cleaned out the top feeder, which then went back in place atop it all. The hive has totally grown. Wow, look at Boris now! _For comparison's sake, here are some shots of my hive that I forgot to include, from pickup day back in May. There it sat at the far right, the only bright yellow box out there in a "nuc field", chock full of other nucleus colonies. Wayne Hansen of the Mecklenburg Beekeepers was waiting on us.Here Libby Mack, treasurer of Meck Bees, preps the nuc box for moving. _I found these shots on my phone and regretted not putting them on the blog. While Libby was prepping my box, Wayne gave another beek advice on moving day. 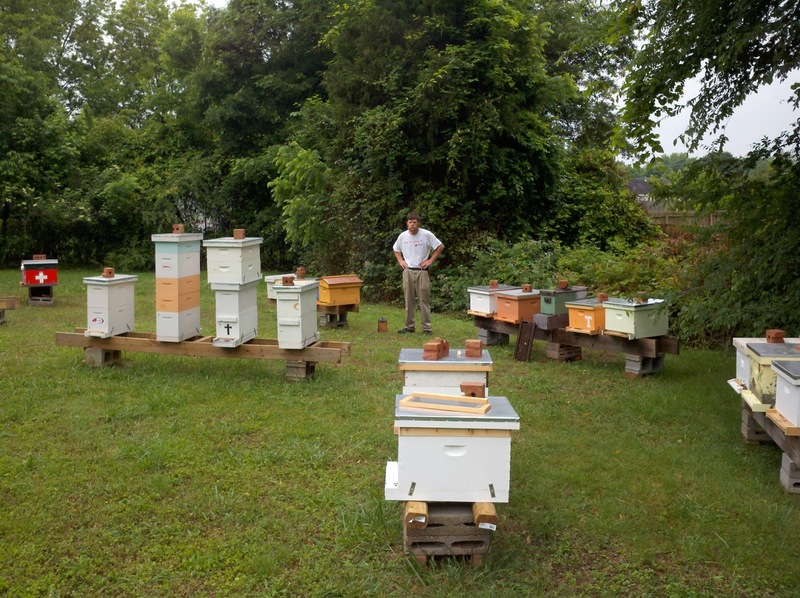 He also gave a lot of input throughout Bee School 2011. And, it was totally cool seeing all these nucs in a single yard. _What's even more remarkable to me is that my nuc came with five drawn frames of bees, brood and queen. And in just two months they've grown from just a few thousand bees to like a gazillion bees now. While I got a late start, due to overwhelming demand on bees and queens this spring, my girls have really worked hard and grown to an amazing strength. So much so that I'll be able to have two hives this year when I was only expecting one. The magic of bees is something else ... and always surprising.